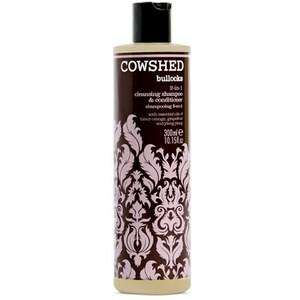 A two-in-one Bullocks Shampoo and Conditioner from Cowshed. Ideal for the well-groomed gentleman, the cleansing liquid removes excess oil, dirt and grime from hair to leave it soft and refreshed. Enriched with essential oils of bitter orange, grapefruit and ylang-ylang to rejuvenate the hair and scalp and sage leaf extract, which effectively fights dandruff. Specially formulated with antioxidant fennel extract, the shampoo and conditioner reduces irritation and delivers intense moisture for long-lasting comfort. Perfect for men who like to look and smell good with minimal fuss, hair will be left with an uplifting fragrance. E.N. Massage into wet hair from root to tip. Leave for 2 minutes and then rinse.